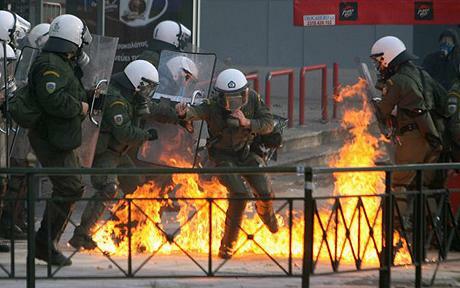 More eyewitness accounts of the riots in Greece, and testimony about the murder of Alexandros Grigoropoulos by police. Athens 2-3,000 took the streets responding to the callout of the Law school occupation for a demonstration. The cops seemed very passive, for once. There are rumours that they are running out of tear gas, which is why they had to play passive today. A large part of the demonstrators passing in front of the police lines spat at them, throwing them stones, paint. Patras at least 5-6,000 people took the streets for the demonstration called by the university occupation and in response to the recent coordinated police &fascist attacks. Eyewitness says: “one of the most beautiful demonstrations I’ve ever been to. The atmosphere was simply amazing, an unprecedented amount of people on the streets… The riot police are still on the street, together with the hordes of their undercovers, but the demonstrators made them look so much weaker today”. Thessaloniki Eyewitness account: “The demonstration, called by the occupation of the Theatre School of Thessaloniki, started off with around 500 people. High school students kept joining in though, so we ended up with 1,500-2,000 people marching through the working class suburbs of the city. The cops tried to provoke us but it was impossible. The most amazing thing about today’s demo was that the meet-up between the anarchists and the high school students that we were all hoping for, did happen”. Eyewitness in Thessaloniki: 2,000-strong demonstration in Thessaloniki is constantly being provoked by the police. In the Northern town of Komotini, in Thrace, 300 local students and students from the adjacent city of Xanthi are besieged in the university - around the university grounds, 200 riot cops, undercovers and Golden Dawn fascists are threatening to enter. Mainstream media report that 25 police stations are besieged across Athens, with heavy clashes at some. They also report that more than 4500 tear gas cannisters have been thrown by the police these days; their supplies are running out (!) and more are being ordered from abroad. Fresh demonstrations have been called for Athens, Thessaloniki, Patras and many more cities this evening. Reports on indymedia this morning claim that Alexandros’ murderer was a member of the nazi group “Golden Dawn” in the late eighties/ early nineties (without cutting his ties since) and that his family was active in the nazi collaborationist forces. A boy resides out-of-place. Two pigs charge into the out-of-place. In the conjuncture of these two trajectories, an event is born. The boy challenges the violation of the borders of his out-of-place by the pigs. The pigs park in-place and cross once again the limits of the heterotopia, on foot. The pigs injunct the boy. The boy responds to the injunction. The pigs shoot and destroy the life that “is not worth being lived”. The pigs return in-place. The borders of the out-of-place are ruptured and urban space, from end to end, is recomposed into a thick burning network of heterotopia: the city is on fire. For sovereignty, every life out-of-place is a life that is not worth being lived. The state of exception is imposed, even by suspension, on every life out-of-place, on every life that is acted not as a contemplation of privacy and its commodity-panoply, but as a social relation, as a self-constituted construction of the space and time of conviviality. The sovereign exception is not so much about the control or the destruction of a excess in itself, but about the creation or the definition of a space where juridico-political order can be perpetually validated. The state of exception classifies space and the bodies within it. It puts them in order. It imposes order upon them. With assimilation, commodification, surveillance and discipline. Executing the delinquent with prisons, psychiatric units, marginalisation. And wherever, whenever might be necessary: with bullets, with bullets, with bullets. In a society dedicated to the production of privacies, the murder of a boy can only be conceptualised in the terms of the value of his privacy, the ontological base of property: the sacred right to one’s own life. This is the only way in which death can be political: as a destruction of the source of property. The destruction of property, let alone its source, is a dreadful crime in the bourgeois world. Even, or especially when it is committed by the apparatus charged with its protection. But to destroy properties in order to take revenge for the destruction of property, that is a doubly nefarious crime: Have you not understood a thing? All those tears, all the dirge, the requiems are not for a boy that attacked the power-that-safeguards-property, they are for the power that failed in its duty: the duty to defend life as the ultimate property, as privacy. The body of an enemy now deceased can be sanitized, pillaged, transformed into a symbolic capital for the reproduction of sovereignty and finally, in the announcement or reminder of the capacity for the imposition of a generalised state of exception. An emergency confirming the sovereign monopoly on the definition of the real through the abolition of its symbolic legitimisation. The sovereignty, in tears, shouts: you are all private individuals, else you are all potential corpses. And society falls on its knees in awe of its idol and shows remorse: mea culpa; from now on, I will take care of myself only, as long as you safeguard its reproduction. The return to the normalcy of the private is paved with the spectacle of generalised exception. Flesh Machine is an anarchist magazine “on the body and its desiring machines” published in Athens. It focuses on original publications and translations of articles and interviews on biopolitics, schizoanalysis, feminism, queer politics and the other wet aspects of capitalism and the revolution. UPDATE, 13:22 The police station of Korydallos in Athens was attacked with molotov cocktails and stones. 700 students remain near a road leading to the local prison; there were clashes outside at least another six police stations in the capital. Mainstream media report that at this point 10 major roads in Athens are blocked off by high school students. Reports come in, one after the other, of university departments being occupied by their students. UPDATE, 8:08 The town hall of the suburb of Agios Dimitrios in Athens is now occupied by anarchists. Heavy clashes between police and anarchists at the Polytechnic during the night; one comrade injured. The occupation remains. A kid of their age was assassinated. They took the streets to protest only to have tear gas thrown at them, to be violently arrested, to be shot at. Yet hour by hour, day by day, the school students on the streets become more militant and determined. So far they have attacked more than six police stations across Athens. Yesterday in the suburb of Petroupoli, around 100 of them attacked the local police station, smashing it up with sticks and stones. A few banks down the same road were also attacked. Until yesterday night at least 100 schools in the country were occupied by their students. This number is expected to jump up today, when most students are supposed to return to their schools for the first time after Alexandros’ death. Whether they chose to do so or not could largely determine the future of the revolt. Luckily, they seem to have no intention to return to normalcy: For today, 11.12, the students are planning decentralised road blockades across Athens. For tomorrow, Friday, demonstrations are called by university students in Athens and Thessaloniki - universities are also expected to be occupied in large numbers today and tomorrow. The Economics University anarchist occupation has decided to reach out to the students; newspapers, posters and leaflets are being printed right now, to be distributed to schools across the city asap. The future of our struggle seems to be dependent on them and I am confident we are in good hands. Short abstracts from the testimony of Epaminondas Korkoneas, the murderer of Alexandros, which was released today. I cannot make a single comment on this piece of filth. All I can say is Alexandros, RIP: None of us have any intention of retreating from the streets before some sort of revenge, before some sort of justice is paid for your murder. “The deceased and his gang attended the swimming pool of Chalandri in Athens and participated in the violent events that occurred there, injuring citizens and the coach of Olympiakos Club by using various objects, including a crowbar. Following this they joined in with the commonly-seen hordes that gather to attack the offices of the Socialist Party, a customary occurrence in Athens on a Saturday night”. “As a matter of fact, I have been informed that these youths, while residing in the affluent suburb of Palaio Psychiko, tend to hang out in the area of Eksarhia which they chose as their recreational area together with various sports grounds where they cause trouble, not showing the attitude and personality expected to be seen in a 15-year old teenager”. “The deceased had been expelled by the Moraitis private school in Athens and changed schools often, a fact proving his deviant behaviour”. “As for the events of Saturday: Seeing a group of around 30 youths at a distance of 10-15 meters from me, not being able to intercept their aggressive move toward us and being in a state of fear for our own lives, we moved, turning our backs against them. At the same time, in order to secure our exit, being shocked and in fear and since the crowd did not stop moving toward us despite my colleague throwing them a “sound” grenade, I pulled out my gun and guided by the instinct of survival I shot two warning shots in the air, maybe a third one that I hadn’t noticed but my colleague reminded me of later”. His lawyer, Alexis Kougias (remember this name) stated: “It is now only up to the Greek justice to decide whether the youth was justly killed, or not”. Demonstrators in Kotomini need to strike first, drive the cops and paramilitaries out of the uni grounds - as I understand the situation (correct me if I'm wrong), if the university is lost then the demonstrators might not be able to regroup at all, or at the very least their situation will be severely weakened. It's all well and good laying seige to the police stations, but if the demonstrators storm them and make off with the equipment there then the stations themselves will be just another building and the attention currently committed to beseiging them along with the equipment appropriated can be shifted elsewhere - such as defending the university, in the case of Kotomini, or storming the center of government. If the revolution is to survive, people need to reach out to comrades in the military to mutiny, otherwise it's only a matter of time before they're pitted against comrades on the street in leu of the police and while the police can be effectively fought with improvised weapons it may be quite different and certainly far more deadly if the government brings the army in. Also, I would like to discourage people from attempting to exact "revenge" or "retribution" against Korkoneas - as dispicable as his actions were, he was acting on the preconcieved prejudices of his upbringing and situation which to some extent we are *all* subject to. If he remains an enemy combatant - and having not resigned his position as a cop, he does - then he may be restrained if possible or killed if restraining him is impossible and doing so is likely to prevent further deaths. But I appeal to all not to actively seek retribution against another victim of the barbaric society and inherent fallibility which ultimately effects the way each and every one of us acts. After all, need I remind anyone here that it is the very society whose influence made him into a killer against which we all fight?